A binary tree is made of nodes, where each node contains a "left" pointer, a "right" pointer, and a data element. The "root" pointer points to the topmost node in the tree. The left and right pointers recursively point to smaller "subtrees”. Empty tree: A null pointer represents a binary tree with no elements -- the empty tree. Where the left and right pointers (recursive definition ahead) each point to a binary tree. They differentiate only with one feature that is the organization of the data. A binary tree is a tree that is limited such that each node has only two children. If n1 is the root of a binary tree and n2 is the root of its left or right tree, then n1 is the parent of n2 and n2 is the left of n1. The nodes are siblings if they are left and right children of the same parent. The level of any other node in the tree is one more than the level of its parent. These names are chosen according to the step at which the root node is visited. 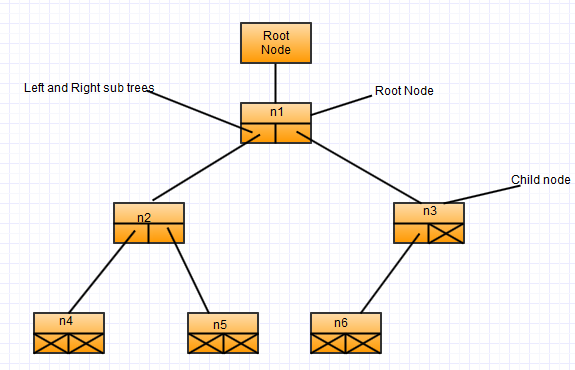 The node is visited before its left and right sub trees. The root is visited first between the subt rees. The root is visited last after both sub trees.